Snake Tray is always looking for talented people to join our innovative and fast growing company. If you like being a team player and are motivated and a self starter please contact us. Snake Tray is looking for dynamic and self motivated regional sales managers to help us sell our cable management, power distribution and enclosures to engineers, contractors, distributors and end users. As a regional sales engineer, you will manage the territory and interface with our sales reps. You will also be responsible to get our products specified, conduct lunch-n-learns for our customers and handle all customer visits and inquiries for the region. We are currently looking for the Texas and Washington, DC regions. 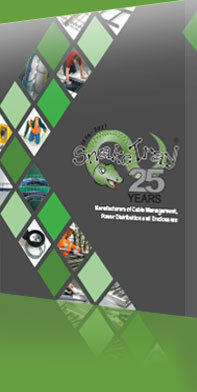 Snake Tray is looking for experienced press brake operators to join our manufacturing team. We are looking for tech savvy people who love working with customers to handle product questions, prepare quotes and take-offs. Snake Tray hires pro-active thinkers and doers. If you have a zest to work in a fast-paced entrepreneurial environment, send us your resume at hr@snaketray.com.